The Supreme Court has cancelled allotment of coal blocks to private and government mining companies. Will choosing auction route to allocate coal blocks make coal-fired thermal power expensive? Within a few months of the Narendra Modi-led National Democratic Alliance (NDA) coming to power, the Supreme Court cancelled allotment of coal blocks to private and government mining companies, terming all allocations made between 1993 and 2010 as illegal. The cancellation of 214 coal blocks followed a public interest petition filed in the wake of a Comptroller and Auditor General of India report that said the government exchequer incurred a loss of Rs 1.86 lakh crore because of allocation of coal blocks to private companies without taking proper auction route. While cancelling allotment, the Supreme Court asked the government to auction the said coal blocks by March 31, 2015. The direction led to the introduction of Coal Mines Ordinance in Parliament. On March 20, Parliament cleared the ordinance which provided the legal framework for auction of coal blocks. While Opposition parties wanted several amendments, none of these were passed in Parliament, paving the way for the ordinance to become Coal Mines (Special Provisions) Act, 2015. The auctioning process was started in February. 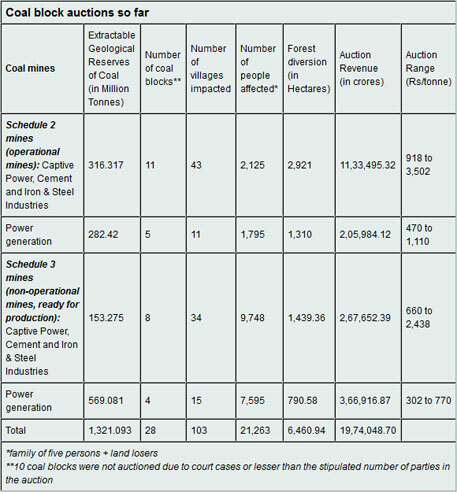 So far, 28 of the 214 cancelled coal blocks have been put to auction and 18 have been allotted to government companies (see table). These coal blocks are expected to fetch Rs 19,74,048 crore for the government by the time the lease periods for coal extraction end. (The auctions are taking place in phases and the process for 186 coal blocks is yet to be started.) However, due to pending court cases and few takers for coal blocks for reasons of lack of viability, 10 of these coal blocks could not be auctioned. The Central government divided the coal blocks into two categories – regulated and unregulated. Power sector falls in the regulated category, while steel, cement and captive power plants fall in the unregulated category. Nine coal blocks have been auctioned in the regulated category through reverse bidding, wherein lowest bidder would be awarded a coal block. For example, if the cost of mining a coal block is Rs 800 per tonne and one bidder offers to mine coal at Rs 500 per tonne, while the second bidder offers Rs 400 per tonne, the second bidder will win the coal block. (Earlier, power plants buying coal from Coal India Limited and importing coal from abroad were allowed to charge customers for the cost of the coal, leading to the increased tariff.) With these auctions, a coal mining company in order to produce power has to mine at a lower cost and sign power purchase agreements with various state electricity boards. 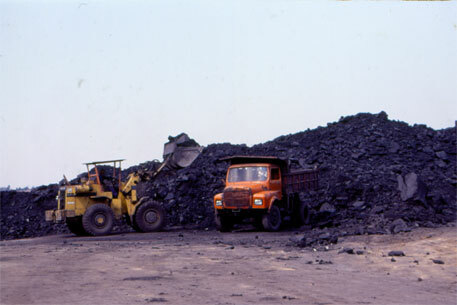 While power purchase agreements are yet to be signed in many cases with regard to the new coal block auctions, in order to make the power production viable, the power companies either will have to charge the customer or demand subsidy or some arrangement by which coal mining remains viable for them. On the other hand, blocks in the unregulated category were auctioned through forward bidding. Here the highest bidders won. Nineteen coal blocks were auctioned in this category. The auctions were conducted in two stages. The first stage – the technical bid – was open to all companies. In the second stage, 50 per cent of all technically qualified bidders or five bidders, whichever number was higher, were selected for bidding through electronic auction. The companies were allowed to place bids in two ways – either as a single bid for the company, or on behalf of their individual power plants. According to sources in the Ministry of Coal, 10 coal blocks despite being ready did not find many takers. Ministry officials are also investigating if coal mining companies had formed cartels. Among the 18 blocks which have been re-allocated to various government companies, coal ministry is yet to decide on the fate of the mine development operators (MDO). Before the Supreme Court judgement, 40 coal mines owned by the government institutions were mined by private contractors, also called MDOs. After the judgement, the liability of the mines, which ought to ideally rest with allottees as well as MDOs, has not been shared in many instances. For instance, Eastern Minerals and Trading Agency (EMTA), which controls mining in 60 per cent of government-allotted mines as an MDO, flatly refused to pay the penalty of Rs 295 per tonne imposed by the Supreme Court on coal mines named in the coal scam. Similarly, relief and rehabilitation is yet to be taken up seriously in Parsa East and Kente Besan coal block in Chhatisgarh, where Rajasthan Rajya Vidyut Urja Nigam Limited (RRVUNL) is the mine owner and Adani Mining is the MDO. On May 23, EMTA was again chosen as MDO by government-owned Punjab State Power Corporation Limited’s Pachhwara mines in Jharkhand despite violations by the company. While auctions have brought a good amount of revenue for the Central as well as state governments, there are larger questions that the government needs to address. One important question is whether coal mining will now be viable? In order to make it viable for the companies, the government has to charge more from the end consumers. However, the government is also working towards making electricity cheaper, in which case the business of coal mining will become unviable. Providing a subsidy to a polluting business would be a blot in environmental regulation, so ultimately government should put the revenues generated by the auction to good use and create more avenues for making renewable energy more viable. While in the present auction, about 6,700 hectares of forests area will be diverted to mining, government will not relook at the forest clearances granted while coal blocks were illegally allotted to government and private companies from 1993 to 2010. Last week, the Union environment ministry clarified that coal blocks which have secured forest and environment clearances from the ministry need not start the process of securing these clearances afresh. On the face of it, the move seems to lessen the time for paperwork for industries. However, many coal mining areas are located close to wildlife corridors and even national parks. In several cases, such as Singrauli in Madhya Pradesh, where coal belts crisscross through wildlife corridor of Kanha National Park, a tiger habitat, there has been a long-standing need for cumulative environmental impact assessment, depending on which coal mines could have been identified and auctioned. The Supreme Court judgement on the coal block allocation offered an opportunity to the ministry of environment and forests to assess such areas so that a better plan for mine closure and rehabilitation could be formulated. However, the ministry being a regulator of the environmental policies missed this opportunity. Coal mining involves diversion of rich forests and adversely impact biodiversity along with severe health consequence. Hence the price of thermally generated electricity should reflect these ecological and health costs so that there is incentive to move towards renewable energy. Reverse bidding process incentives use of technology in mining to reduce cost and increase utilisation. govt must be commended for this move, but it is not clear how will that impact final electricity prices. Secondly, govt must open the sector for foreign players who can bring much needed technology and expertise and create competition. it will be good for both business and environment. Though the court cancelled all allocations from 1993 but NDA government talk goes around UPA and not on NDA period. One PM gets Bharat Ratna and another PM gets court summons. The NDA government claims through auction, the cornered around 3 lakh crores. But this credit goes to Supreme Court and not to NDA government.